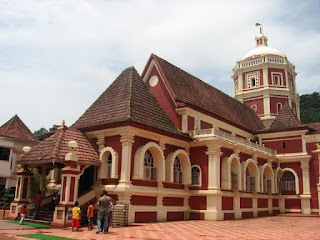 Goa, the erstwhile Portuguese colony, is known for its remarkable heritage buildings, especially the Roman Catholic Churches. These relics have been dated from 16th century onwards, and were influenced heavily by the architectural styles then prevalent in Europe, the Baroque, the Manueline, and the classical. Manueline or the Portuguese Late Gothic shows the composite Portuguese style of ornamentation incorporating the maritime elements and representations of the discoveries brought from the voyages of Portuguese explorers. The construction of churches and monasteries in Manueline was largely financed by the lucrative spice trade with Africa and India. The features of Manueline Architecture are elements used on ships (spheres, anchors, anchor chains, ropes, cables), elements from the sea, such as shells, pearls and strings of seaweed, various botanical motifs, symbols of Christianity, elements from newly discovered lands (Islamic Jali and arches from India), columns carved like twisted strands of rope, semi circular arches (instead of Gothic pointed arches) of doors and windows, multiple pillars, eight sided capitals, conical pinnacles, bevelled crenulations, ornate portals with niches or canopies. Baroque had evolved in Europe around the beginning of the 17th century with the demand of 'new art' in the Roman Catholic Churches. The 'new art' movement was to speak to illiterate rather than the well-informed intellectual masses. Baroque art was direct, simple, yet dramatic. 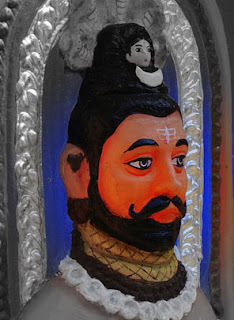 Groups of figures assumed new importance and there was a dynamic movement and energy of human forms. 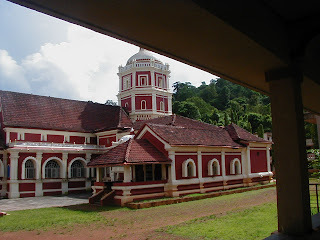 Both Manueline and Baroque had no doubt strong influence over the churches of Goa, but little is known about their influence over the temples of Goa. 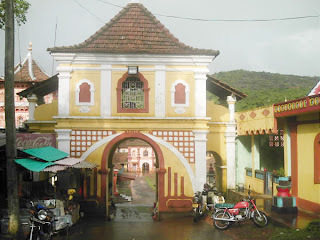 Goa had been ruled by various Hindu dynasties before it was brought under the rule of the Deccani Sultanates, followed by the Portuguese. 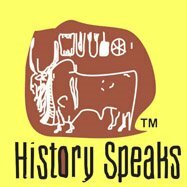 Some of these dynasties were the Chalukyas of Badami, the Silaharas, the Kadambas, the Rashtrakutas and the western Chalukyas of Kalyani. 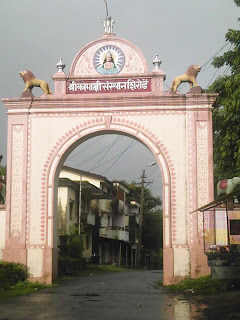 In 1469, Goa passed under the Bahmani Sultans of Gulbarga. 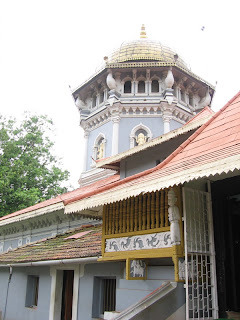 Following the landing of Vasco da Gama at Calicut in 1498, the Portuguese established their trading station at Cochin. 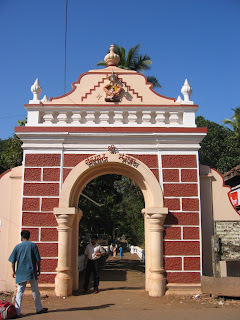 The opposition they met from the Zamorin of Calicut combined with the competition in trade offered by the Arabs, compelled the Portuguese to look out for a new base from where they could control the seas. 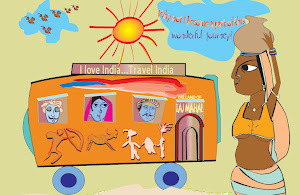 Goa was the natural choice owing to its strategic location with harbours and navigable rivers. With the advent of Portuguese, both public and private buildings began to be erected. 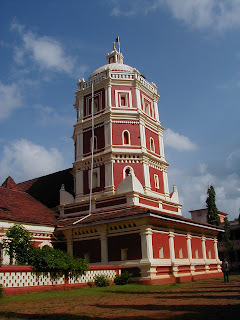 Churches of lofty dimensions attached with equally large convents were built by the various religious orders who settled down in Goa under royal mandates.The temples built in Goa from 17th century onwards also showed combining aspects of Islamic and Portuguese architecture. 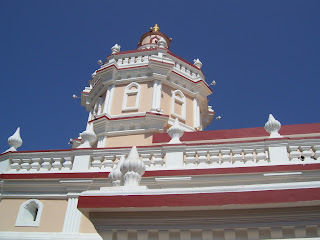 The domed roofs are a Muslim trait, while the white washed octagonal towers and balustrade facades have been borrowed from Portuguese Church architecture. 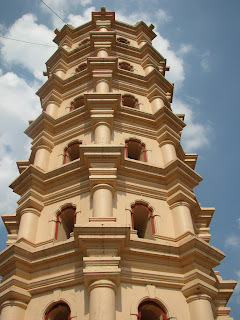 One of the unique features of Goan temples is the deepastambhas of two to four storeys high – the lamp towers, an influence from the Maratha temple traditions. 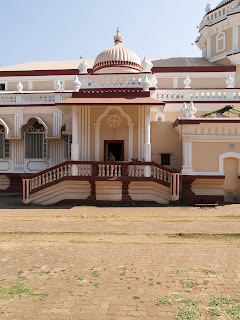 The deepsthambhas of Mangeshi and Shanta Durga temples with their white washed pillars and baroque decoration show unique synthesis of Hindu and Portuguese styles. 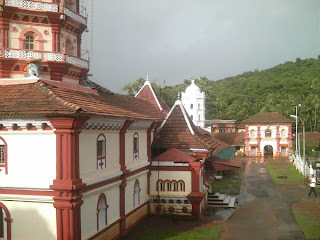 Another distinctive part of the Goan temples where the Portuguese influence is found is the curvilinear roofs of the mandapas. 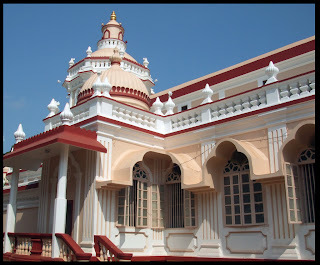 One may ask why in a Hindu temple, which is to be built as per the Hindu canonical text, was influenced by the Portuguese architecture. 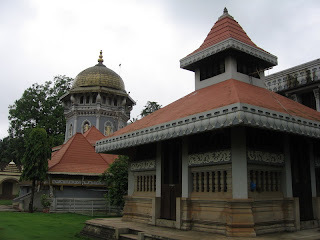 The answer lies in the artisans and craftsmen who were building both temples and churches simultaneously. 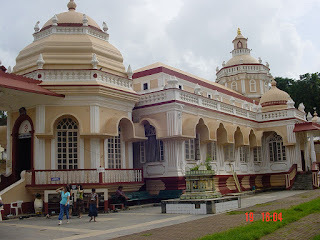 They incorporated the Portuguese style into their temples, giving rise to a unique blend, the Indo-Christian style of architecture. 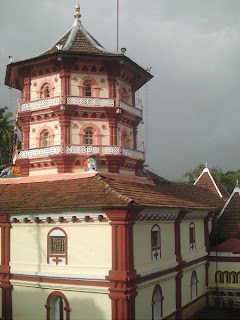 For example, instead of traditional sikharas that usually crown grabhagriha, in the 18th century, temples were octagonal drums crowned by tapering copper domes and over the rest of the temples is the red tiled roof in houses everywhere in Goa. The arched entrances, niches and pilasters that feature in most of temples of this period display a distinct European influence. Inside the temple too the, the mandapa often had a carved ceiling with columns. Sometimes the mandapa or garbhagriha would be decorated with cusped arches, flying angles and bunches of grapes as in Christian churches. 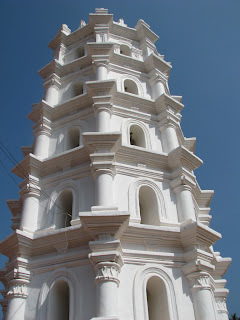 The temples were often embellished with baroque-styled balustrades. Traditionally, it was graffito art that decorated the walls but the recent trend is to have the walls painted in bright colours. The motifs commonly seen were lions, peacocks, rosettes, or simple heart shaped papal leaf borders.